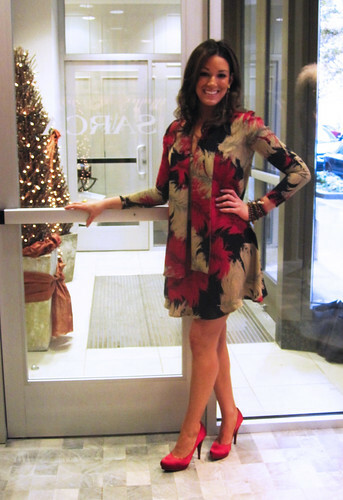 Alexis Cozzini is the owner of Sarca, an exclusive boutique located in the Gold Coast at 710 North Wabash. During the Erin Gordon for Sarca trunk show, Alexis graciously took the time to talk with me about the Chicago fashion scene. Amy: So what led you to open Sarca? Alexis: I have always been interested in retail. I started working in retail when I was 15 at a store in Lincoln Park called Celeste Turner. It’s not there anymore, it was on Armitage, back when Armitage was really the best place to shop. So I’ve just always been interested [in retailing]. My mom’s friend owned Celeste Turner so I got to see behind the scenes. I always knew I wanted to have my own shop one day. So since I was 15 I have always working in retail or fashion in some capacity. I worked at Calvin Klein in their PR department when I was in New York. I’ve worked for Intermix, I’ve worked for Chanel, I’ve worked for tons of places. It’s my passion! I knew that I wanted to have a lot of exclusives. My family travels a lot, I’ve always traveled when I was younger. My dad is from Italy and my mom is from Austria, so we have family there who we go visit every year. In Europe I was exposed to a lot of international designers. It was really important to me to have something here that you can’t find everywhere else. A lot of our designers are really popular in the countries where they’re from, or they’re really well-known there, but they’re not as well-known over here, so they’re all established. We don’t have too many people here who are super-new or just starting out, we do have some, but I prefer to stick with people who are established even though they might not be so popular here. I grew up here. Since I’ve always been into fashion, I personally found it a little annoying at times that you couldn’t find some really cool things here. In my retail experiences here, there are a lot of women who live in Chicago that have the money to spend on cool things or they have that style about them and they really want something that you can’t find anywhere else, or maybe you can only find in New York or you can find it when you go to Italy or Paris or London, wherever. I think it’s a little underestimated here. I think department stores and some other boutiques kind of pigeon-hole us into that Midwest category. I mean, we haven’t had problems selling anything that’s funkier or maybe a higher price point or that’s a little more cutting edge because we’ve been able to tap into a market that really wants that. Amy: How do you explain the Chicago woman and her point-of-view to European brands? Alexis: I just tell them everything I told you. I think that people just have this skewed image of us. Whenever I go buying people are always asking me why I’m not buying larger sizes because they think that everyone in the Midwest is fat. That’s not the case. Most of our customers are tiny! We do have customers who come in and ask [for larger sizes], so we really can accommodate everyone. When I go buying, people think that everything that I’m going to want is going to be conservative. Amy: From my own blog, I’ve noticed a lot of interest from Europe in Chicago. Have you found that as well? Alexis: I have. I think Barack Obama certainly has a lot to do with it. Also, I’ve noticed that Chicago’s doing a lot to promote itself. Between Barack and between the Olympics, [Chicago] is really becoming known as an international city, and it is. I mean, we’re a bigger city than L.A. [by urbanized area]. I think that as a city we’re really taking that next step. Every time I go buying, whether it’s in New York or London or Paris or Milan, everybody is very eager to get into the Chicago market. It’s great, it’s really great for us. Amy: Do you see yourself expanding out of Chicago? Alexis: I’d love to. I don’t know if I would ever open another store in Chicago. I don’t necessarily want to be seen as a chain, but I’d love to open in a different venue at some point. This month is actually our one year anniversary. Amy: That’s a great accomplishment, especially in this economic climate. Alexis: We definitely see it getting better, slowly. Amy: You obviously know your client well. Alexis: I was lucky that I had worked in retail in Chicago for so long that I was able to have a little bit of a small, established client base when I opened. But word-of-mouth really is everything. You really rely on your repeat customers. We’ve been doing really well. We’ve been here a year, and we’re loving it. I probably won’t open another store right away! But I would love to in another market for sure. Amy: My last question is about the newer brands you carry. Do you find yourself trying to nurture new talent? Because obviously you need to have established brands that are proven sellers. But when you look for bringing in a new brand, what is the deciding factor? Alexis: The deciding factor is definitely quality. And price point. If you’re a newer designer, and you have something that’s a higher price point, I look to make sure that it makes sense that that price point fits for what the item is. You want it to be something that is a quality item, and you want that designer to provide you with a reason for something to be at that price point. So it’s totally OK to start out and be a new designer, and have really expensive things, but everything has got to make sense. That’s what I try to [evaluate] when I buy for anything in the store. If it’s going to be expensive, it needs to have a reason for being at that price point and we have to be able to speak about that, and the designer has to be able to speak about that too. It’s really important to me to have quality. Whatever the price point is, I just think that the price should match the item. If something is inexpensive you know it’s not going to be the best quality. It might be a $35 Eryn Brinie t-shirt that we have here. Who wants to buy a t-shirt for $100? I don’t! I like expensive things, but I don’t want to buy a pricey t-shirt. But with a $35 t-shirt, you know it’s only going to last you so long but you’re not paying $100 for it. Amy: And it also allows people like me to buy into the Sarca mystique. I mean, I’m a graduate student at DePaul but it doesn’t mean I don’t love fashion. Having things at varied price points allows me to shop here. Alexis: Right. We do portray ourselves as a luxury boutique and the majority of the things in the store are pricey but we do have things that are at a price point for everyone. You just have to go through the racks. Don’t be afraid to ask us about what an item is, or what the price is. We style people head to toe every day, and we don’t style everyone in things that are a thousand dollars each. You have to mix-and-match, which I love to do. I shop at Forever 21 and H&M, so why not! Amy: Yeah, I think especially in the 2000s, that the whole idea of dressing head-to-toe in designer only went out the window. Women, especially women with money, are mixing. Alexis: [On wearing only designer items] It’s not realistic, and if you truly love fashion you are truly into mixing your wardrobe up. Amy: Well thank you for taking the time to do this mini-interview during your release party for Erin Gordon for Sarca! Sarah Levine is one of my favorite people on the planet, in addition to being an incredibly talented artist. She is wearing the red chandelier necklace from the Lanvin for H&M collection. 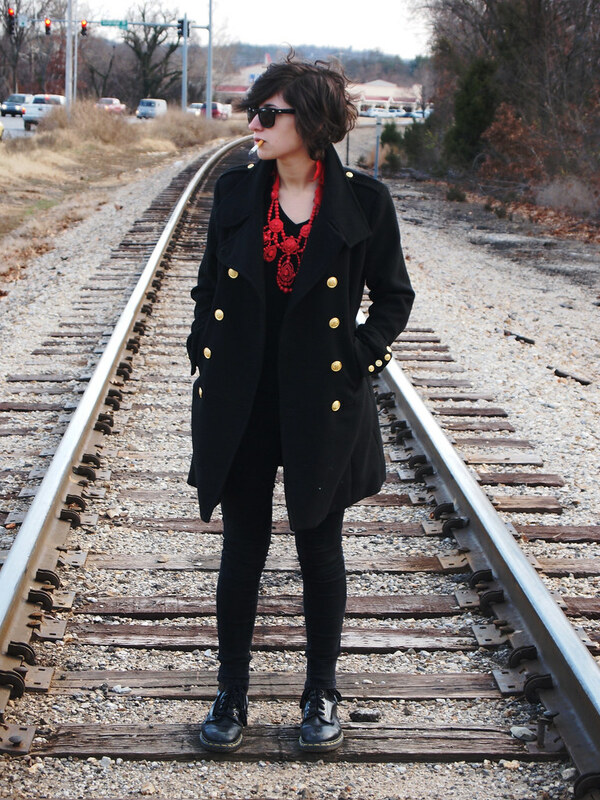 On her feet are vintage Dr. Martens, and her admiral jacket and pants are from Forever 21. 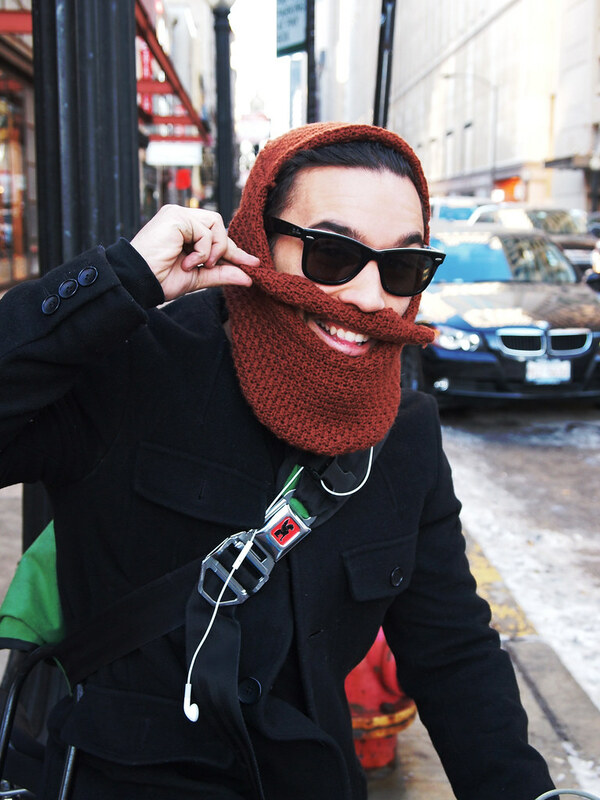 José’s Santa-inspired ski mask is a clever way to stay warm as he traverses Chicago’s frozen winter streets as a bicycle messenger. To all my readers, followers, and stumblers: Merry Christmas from Chicago Streetstyle Scene! I am spending the holidays with my family in Fayetteville, Arkansas, and will return to Chicago on New Year’s Eve. Although my family didn’t move here until I I was in fourth grade, I am proud to consider Fayetteville my hometown. Stay tuned for possible streetstyle photos from Arkansas’ funkiest city!